Colin Furze, five-time Guinness World Record Holder and YouTube's undisputed king of crazy inventions, instructs fans and curious young inventors on how to build ten brand new wacky inventions at home with an affordable tool kit. Colin Furze's bonkers and brilliant inventions such as a homemade hoverbike, DIY Wolverine Claws, an alarm clock ejector bed, and Hoover shoes have earned him 4.5 million YouTube subscribers and more than 450 million video views. 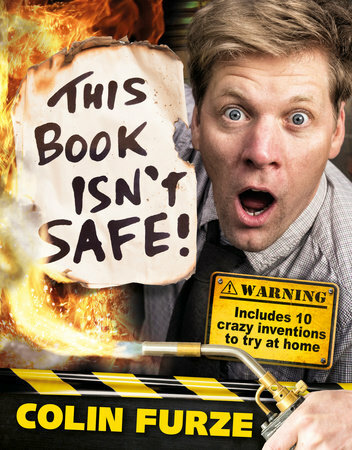 Now Colin is on a mission to inspire a new generation of budding inventors with This Book Isn't Safe! This Book Isn't Safe contains instructions on how to make ten brand new inventions with a basic at-home toolkit, alongside behind-the-scenes stories about some of Colin's greatest inventions and top secret tips and tricks straight from his invention bunker (aka a shed in his backyard in Stamford Lincolnshire).